A tram driver has been taken to hospital with face and chest injuries after a large rock was hurled through his windscreen in a "reckless" attack. The rock was thrown from a footbridge near the Derker Metrolink stop on Monday evening, Transport for Greater Manchester (TfGM) said. The driver managed to continue driving to the next stop near Oldham, where he was met by emergency services. No passengers were injured in the attack. Danny Vaughan, TfGM's head of Metrolink, said: "This one reckless action has injured the driver and left him, understandably, very shaken. "We condemn such behaviour in the strongest possible terms and are working closely with the police, operator and other partners to tackle problems of anti-social behaviour along the line." 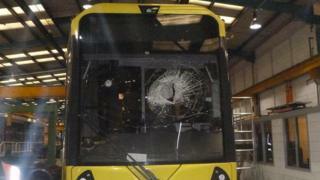 New Greater Manchester Mayor Andy Burnham said: "Attacks on Metrolink will not be tolerated. "The consequences of last night's incident were disgraceful. Nobody in Greater Manchester should be made to feel unsafe while travelling or at work."